Ortega y Gasset Projects is pleased to announce The Quick Brown Fox, a series of events, performances, film screenings and public interventions this Summer at OyG. Please see below for a complete list of our programming. “L’appel du vide”, or “The Call of the Void”, is 6 act interdisciplinary performance created for Ortega Y Gasset Projects by Patricia Brace that mirrors one person’s story as it travels through the collective consciousness of 6 performers. Performed on a mirror-stage, “L’appel du vide” uses repetition, reversal, and reflection in an attempt to create the interstice between fantasy and fiction. Like love, as in lust, “L’appel du vide” quotes Marcel Proust, Oscar Wilde, and Jacques Lacan to portray desiring something other than what you have, or what you know. Viewing this performance as a visual and psychological analysis into absence, or the void, Brace collaborates with rappers, dancers, programmers, musicians and native French speakers to create a scenario of both interconnected and disparate desires, violence and truth. Featuring the work of artist and programmer A. P. Vague, classical dancer Marie Ferguson, country punk noise band Irrevery, identical twins Sam and Lex Steiner, native French speaker Marine Cornuet, and guest appearance by deceased Supreme Court Justice Antonin Scalia, “L’appel du vide” juxtaposes lived experience with the desired, depicting one person’s life as it grows increasingly symbolic. These three performance artists use found text, monologue, ritual and interaction with sculptural objects to destabilize cultural constructs and address the viewer’s inward experience. Organized by Sarah Rushford, the group of artists was selected from Emergency Index; an annual anthology of performance documentation published by Ugly Duckling Presseand edited by Yelena Gluzman and Sophia Cleary. The approaches each of these performers take to reach the audience are drastically different from one another and individually they are also refreshingly volatile in tone and intent. Christie Blizard, coming in from San Antonio, claims to be embodied by rock legend Keith Moon. Her costume and monologue are both doubt-worthy and electric, like that of a stand-up-psychic-medium. Libby Rowe, also traveling from San Antonio, performs several works including Pearls of Wisdom in which she works to put on a pair of impossibly long white gloves while reading idiomatic phrases relating to good manners. 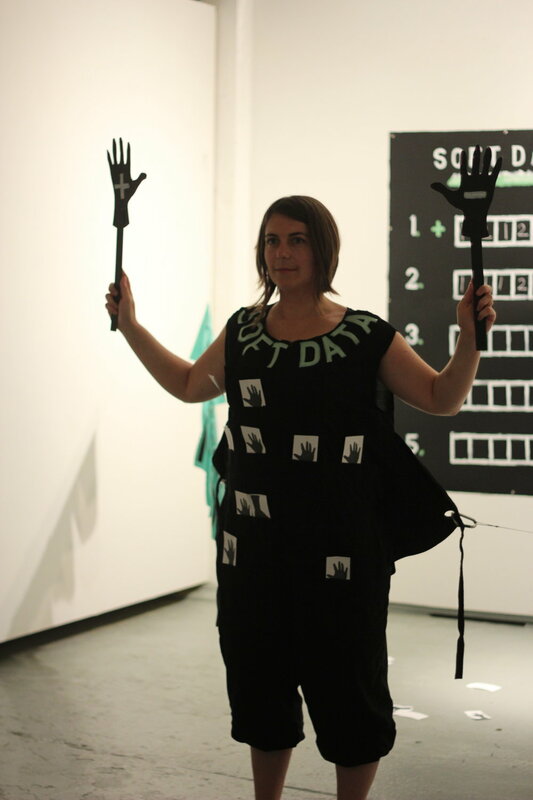 And Cayla Skillin-Brauchle hailing from Salem, Oregon to be with us at OyG performs Soft Data, in which the artist’s costume functions as an informal polling station and votes are cast by slipping pieces of paper into a custom-made jumpsuit covered in small pockets. All three artists will perform at 3pm and 7pm. What is touching and tasting? What does it mean to yield to a tactual provocation as the recipients of art? Does activation of the senses, other than vision, launch some other mechanism for the understanding of works of art? Through the reassessment of a daily activity, GOLDENROD examines how memory can inform our present day perspective. During a two month residency at The Wassaic Project in the fall of 2015 (Wassaic, NY), Brigitta Varadi collected and dried local goldenrods following her grandmother’s knowledge. She created 1000 Goldenrod Tea bags, each numbered and signed, accompanied by 100 screen printed tea boxes. The work echoed Varadi’s grandmother’s own practice: a process-oriented labor and old tradition passed down from each generation. The tea becomes a symbol for both the artist and the audience to question and examine multiple levels of depth regarding memories of the past. In addition to the tea, Varadi created objects using textured wool dyed with goldenrod – hand felted and hand stitched – to provide a platform for an intimate engagement of conversing and tea drinking. Tickets are $5. All money goes to the performers. An evening of comedy, poetry, performance, improvisation, stories and food. Featuring Ike Ufomadu in A Few Moments of Comic Entertainment with Ike. Zahar Vaks in Sensual Watermeloncholy. Audience participation will be awarded with intimate sized drawings.